On our third day traveling the southern Ireland coast, my husband and I toured the Ring of Kerry. We spent our entire day stopping our rental car to take photo after photo. It was beyond stunning. Imagine all of the photos you saw of Ireland growing up - that is exactly what we saw, times 1,000. One thing I tell everyone who asks how our trip to Ireland was "it was exactly how we imagined it, but better". We traveled clockwise on the Ring of Kerry, which is suggested if you are driving - so you go against the tour bus traffic. We went in the month of October and never once had to share the roads with a tour bus. It was perfect. Our first real stop was at the Staigue Stone Fort. This fort was thought to be built during the late Iron Age, between 300 and 400 AD. The history that walls held were beyond words. It was a hike to see the Fort but we had our sheep stand-off and between that and the history of the fort, it was worth the 30 minute detour. Speaking of animals. If I am ever reincarnated as a cow, can I PLEASE be a Ring of Kerry cow? When I did the research on Ireland, I saw a lot about surfing in Ireland. As my husband travels all over for surf trips, Ireland was never on his list - until this trip. Prior to lunch we stopped at the Skelligs Chocolate Factory to check out all the hype. We left with a few bars of chocolate and today, I am wishing we brought home more. 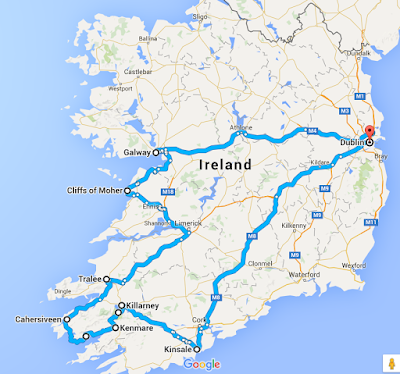 We spent about 3 hours driving the Ring of Kerry from Kenmare clockwise. We stopped at almost every photo opp. While the prawns were smaller than the prawns we are accustom to and the seafood chowder was a little thicker than I prefer, we had an overall decent lunch. By this day, we learned if we weren't set on a dish to split it and we got to try a few staple items at this restaurant and left with full bellies. We were fortunate not to have an overly hazy day. While the fog limited some of the mountain vision, our overall day was incredible. The Ring of Kerry is a MUST SEE in Ireland. I've had some who told me to take two days exploring it but we were beyond happy with the half day visit. Ring of Kerry : It's Ireland - exactly how one would imagine it. After we left the Ring of Kerry, we intended on visiting Dingle. The storms were settling in and I had one thought on the mind - castle. We headed to our next stop, Tralee where we stayed at the Ballyseede Castle. Stay tuned!